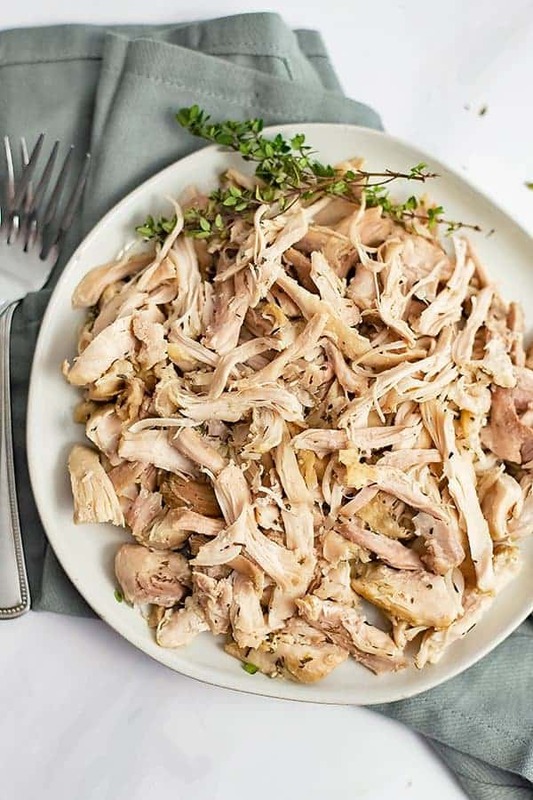 This Instant Pot shredded chicken thighs recipe will help you make quick and easy moist, tender and juicy chicken that you can serve any night of the week! 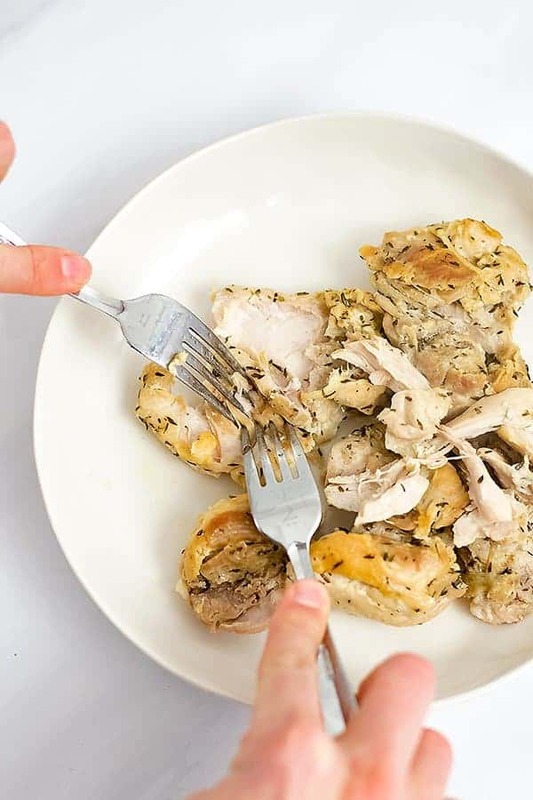 Perfect for meal prep or bulk cooking, this shredded chicken can be used in so many ways throughout the week, you are going to love this simple gluten free, paleo, Whole30 and keto friendly recipe! Pressure cooking chicken in the instant pot (affiliate) has become my go to method for meal prepping protein for Dave to eat at work all week. Using the pressure cooker to make chicken thighs is so simple, requires very little time, and unlike my slow cooker shredded chicken, it’s ready in about 30 minutes! 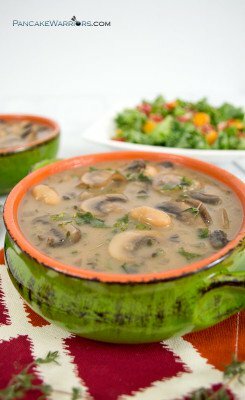 It’s a great alternative when I don’t have time to wait on the slow cooker! 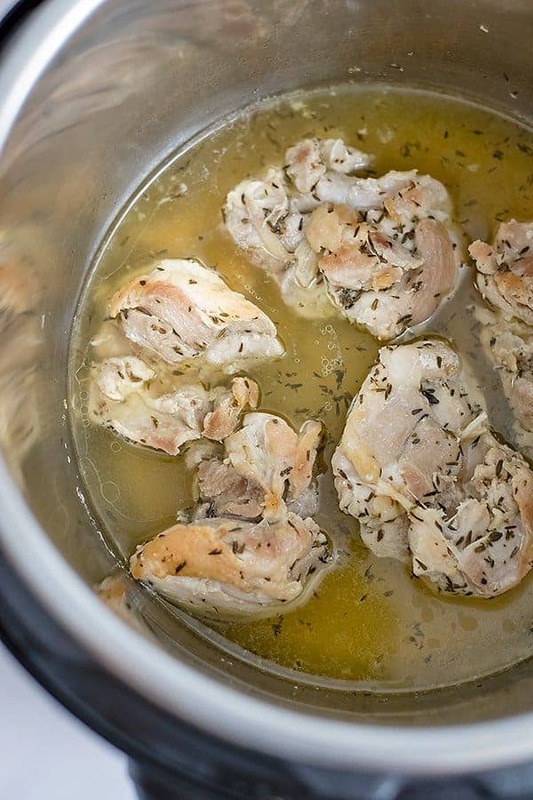 This recipe for instant pot shredded chicken thighs is not seasoned except with salt and dried thyme. This is so that the chicken will be free of any flavoring and can easily pair well with almost any sauce or dish you want to use it in! 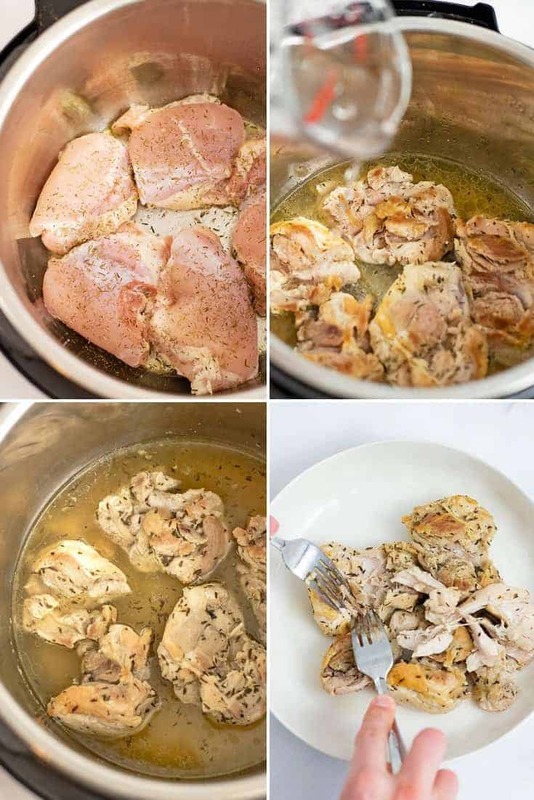 However, if you plan on using all the shredded chicken in just one dish, feel free to add those seasonings to the chicken to help infuse the flavor into the chicken. To lock in flavor (this step is optional): first sear the chicken (in a tablespoon or so of oil) by cooking it in the Instant Pot on saute mode for 7-10 minutes. Season the chicken with just salt and dried thyme before cooking. After searing the chicken, flip it over and add 1 cup of water. Add the lid and cook with high pressure for 12-15 minutes, depending on how much chicken you are cooking (12 minutes for 1 pound, 15 minutes for 2+ pounds). Allow the pressure in the Instant Pot to vent naturally if you have the time, otherwise manually vent once the chicken is done pressure cooking. What is the best chicken for pressure cooking? One thing I have discovered is that chicken thighs are the perfect solution for meal prep shredded chicken! Chicken thighs are more forgiving, they don’t dry out as easily as chicken breast and they tend to have a bit more flavor. Dave actually prefers the flavor and I love that they are less expensive than chicken breast! I have made this recipe many times with chicken breast and it always turns out great. You have to be careful with how thick the chicken breast is though. It can take more time to cook if it’s very thick. So you can either butterfly it (cut it in half so it’s not so thick) or you can cut it down into strips to cut down on the cooking time. Does the kind of chicken I choose matter? Be sure to buy boneless, skinless chicken thighs (or breast) for quick and easy prep. If you do get the bone-in, you will want to add at least 5 minutes to the cooking time. Always be sure to check the temperature of your chicken, especially when the bone is still in! I have used the skin on chicken and it’s just a mess when trying to shred the chicken, so unless that is all you can find, use skinless for sure! Put all the chicken in a stand mixer (like a KitchenAid) and use the paddle attachment to quickly shred the chicken. Personally I usually only make 1.5-2 pounds of chicken at a time so I just use 2 forks. 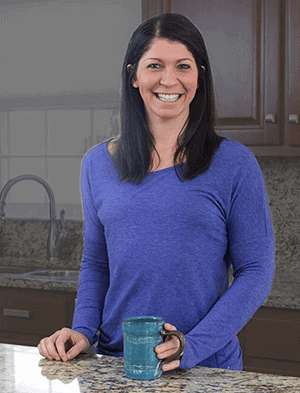 If you are doing a large prep, you might want to use the stand mixer option to save time! 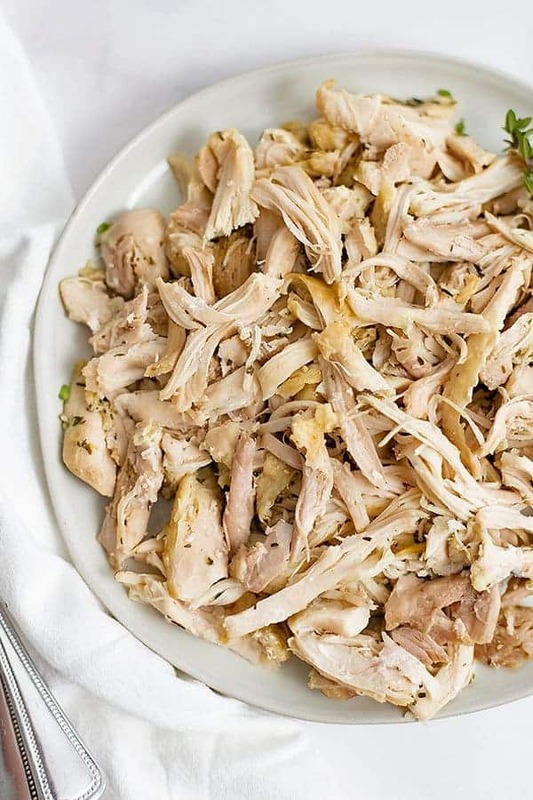 Can you freeze instant pot shredded chicken? Yes! It’s easiest to portion the shredded chicken out into single serving portions (using ziplock bags or small freezer safe containers). This way you don’t have to defrost more than you need! 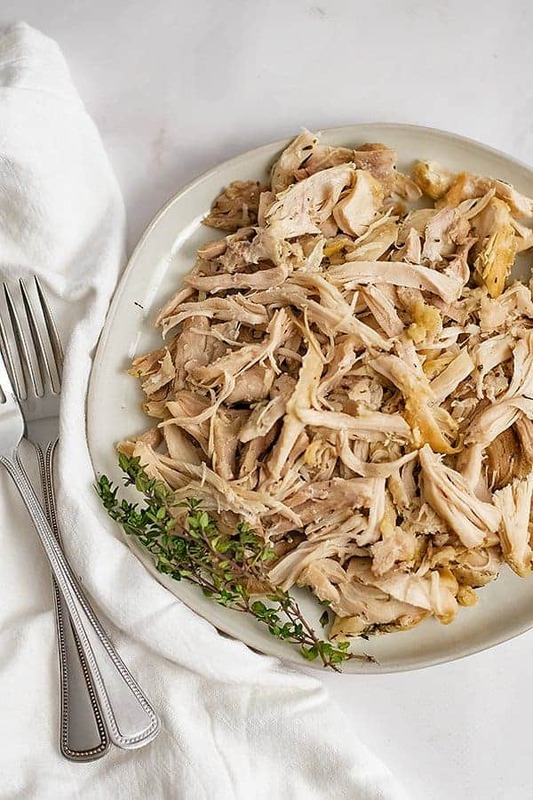 How long will instant pot shredded chicken thighs last in the fridge? You can store the shredded chicken thighs in the fridge in a sealed glass container or Tupperware for up to 3 days once cooked. If you are trying to prep for the entire week, simply portion out days 4-7 in ziplock freezer bags and freeze immediately. On day 3, pull 1-2 freezer bags out of the freezer to defrost. Continue this for the rest of the week. What can the shredded chicken thighs be used in? See how easy it is to make in the video below and let me know if you have any questions in the comments below! 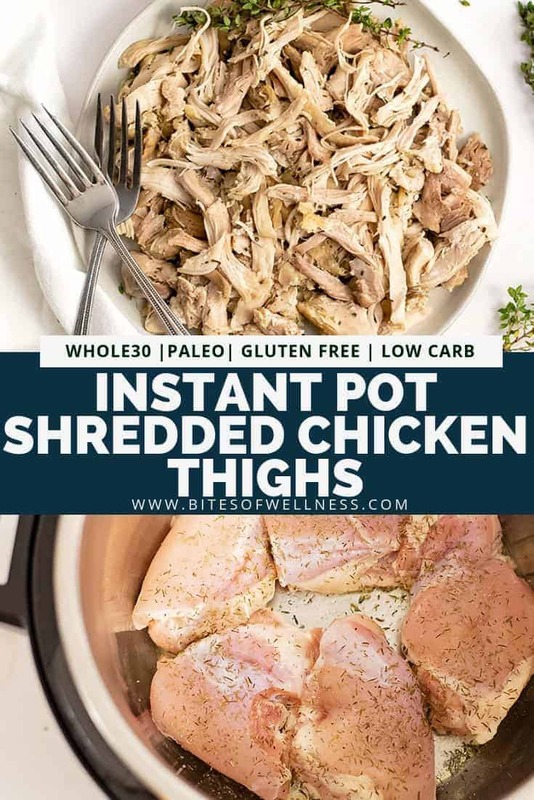 Instant Pot Shredded Chicken Thighs - how to cook moist, tender and juicy chicken in your instant pot! This quick and easy method is perfect for meal prep or bulk cooking and can be added to burritos, tacos, sandwiches, salads or soups for a quick and easy meal! Start by searing the chicken in the instant pot (optional). To do this, turn the Saute function on the Instant Pot and set it for 10 minutes. Add 1 tablespoon of olive oil or use non-stick cooking spray to the bottom of the insert of the instant pot. Add the chicken thighs to the insert and sprinkle with salt and dried thyme, cook for 6-7 minutes. After 6-7 minutes, try to flip the chicken, if it releases somewhat easily, you can flip the chicken, otherwise let it cook for the full 10 minutes. After searing the chicken (and the saute function is done), flip the chicken and add 1 cup of water to the pressure cooker. If you don't have time to sear the chicken first: Place the chicken in the bottom of the instant pot insert. Sprinkle with salt and dried thyme and 1 cup of water. 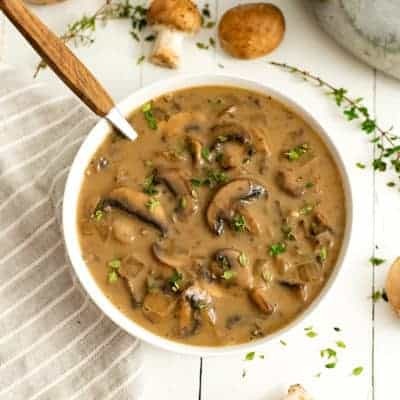 Allow the instant pot to naturally release or manually release if short on time. Shred the chicken and eat immediately or store in the fridge up to 3 days (or in the freezer for up to 3 months).